THE PERFECT POM SHOULD BE ABLE TO FIT INTO A CIRCLE. The Pom should be very compact, and very short backed - the shorter the back the better. The body is very cobby, and the barrel well rounded. Theshort back and huge double coat give the Pomeranian an appearance of a floating ball of fur. He seems to walk on his tiptoes - and NEVER sways, hops or limps - every leg must be straight, sound and steel-like. The bones must be fine - (not spindly - but not heavy either). The neck shouldbe short on a nicely laid shoulder to enable the head to be carried highand proud. The tail must be set high and lay flat and straight on the back, covered by long harsh spreading hair, the tips of thetail and the ruff on top of the head merge together. A long ruff sweeps from under the jaw to give a frill that extends almost to the ground and goes up around the neck and back of the skull until his ears appear almost non-existent. 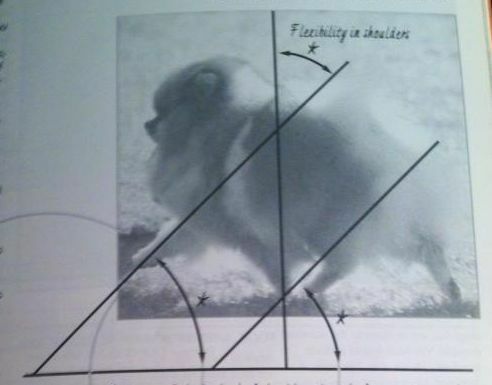 The Pomeranian must have some leg, but should be neither too high nor too short on leg - he MUST be well balanced. The general appearance should be of a well balanced, alert, glamorous and extremely pretty toy dog.